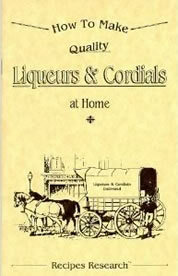 How to Make Quality Liqueurs & Cordials at Home. Learn to make industry quality liqueur & cordials at home, easily. You won't believe how easy it is. The Billion dollar liquor industry would rather you not know about liquor production. For if you knew, sales might just be a little different. Is it legal? You bet. Easy and fun way to organize your recipes; or to create a family cookbook. 95 pre-printed 6" x 4½" recipe cards under 5 sections with notable icons on each: "HeartSmart," etc. Recipes can be indexed. Many tables. Compact, powerful and feature packed makes this... a cooks #1 tool. Key Features/ Benefits: Create a personal, family cookbook, Compact size makes it easy to use, Spiral bound, you won't loose your recipes, Feature packed and yet easy to use.